I've been seeing lots and lots of these adult coloring books lately. I was toying with the idea of trying one, but never seemed to find the time to just well, color. About a mont. h ago, my classmates and I were together at a gathering. One of my classmates had picked up one of these coloring books called "The Lost Sea" and thought it would be fun if we each took turns coloring in the book--sort of like an AB round robin. They asked me to start and I happily took on the challenge. I started by flipping through the pages--all of them were "ocean-themed" pages. Some of them were multi-page pull-outs. I would have loved to have done one of those pages, but was not sure I would have the time. Better to start smaller. The page you see above it the one that I was drawn to. I got out a bunch of my gel pens and got to work. I started from the inside/center and slowly worked my way out. I say "slowly" because I was surprised at how much time it took me to color. 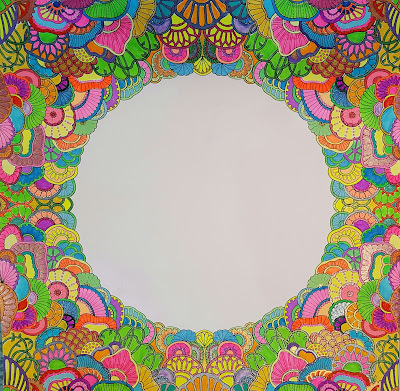 It took me three nights to finish the multi-colored spread (circle frame). I was even more surprised at how unconscious I was of the time I spent coloring. 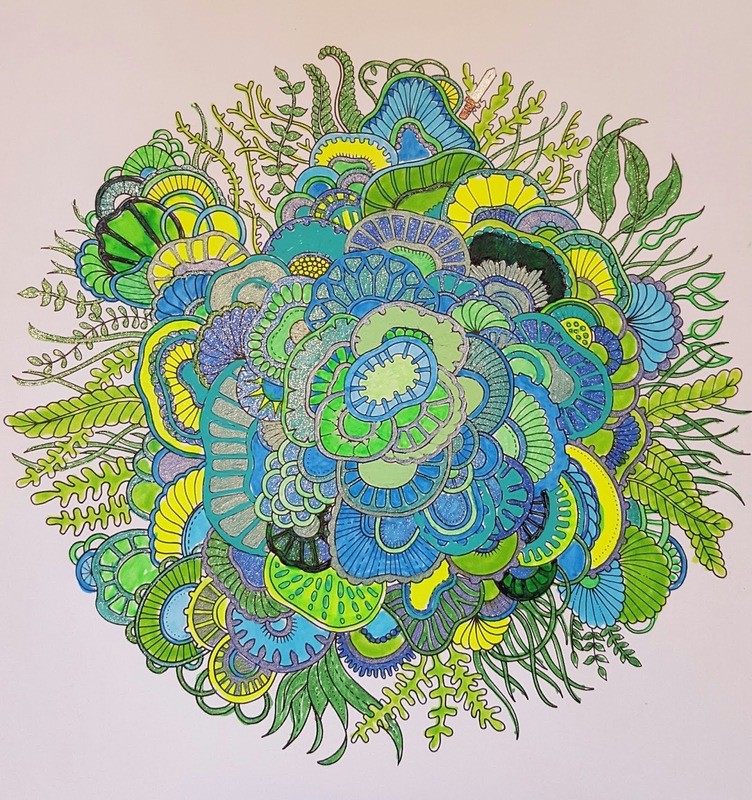 I found it relaxing, almost meditative to sit and get lost in the simple activity of coloring a page. I also found it addicting! As slow as I was to start this project, I couldn't wait to come home after work and start coloring. I found myself with enough time to do the second spread (the simple circle) before it was time to pass the book to the next contributor. I experimented with a green/blue palette since this was, after all, all things "ocean." I had several pens in this palette but ended up using highlighters because they made it easier to cover the larger spaces. 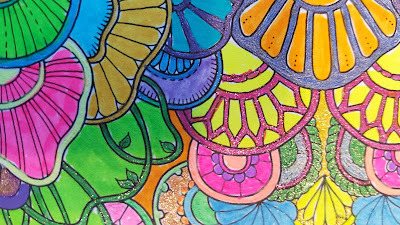 Accents of glitter glue add a finishing sparkle to the pages. 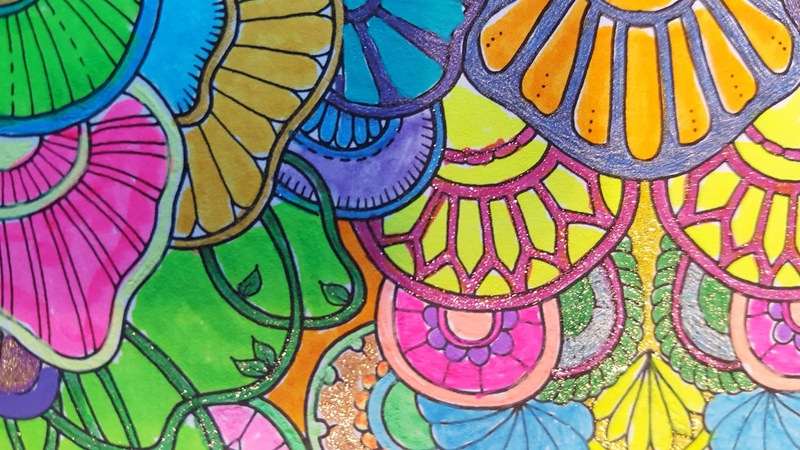 I am now officially hooked on adult coloring books!